The City Council held a study session Monday, March 25, to discuss storm preliminary drain designs for various parts of the city. The council took no action. City officials will apparently be looking at the issue again, among others, during the budget process. College Park East residents called for the city to help them with flooding. A member of the council acknowledged that there is no money to address the problem. During the public comment segment at the start of the council meeting, Doug Freeland of College Park East said he lives over CPE storm drain 1A. He said literally all of the east end of College Park East drains into that drain. According to him, the drain serves 407 houses, but only 239 houses drain into another drain. Later, during the storm drain session, Myrter said the city would look at putting a storm drain there. He proposed putting a drain at Heather and Lampson. He said he wanted the report to address why the city can’t put a new drain at Heather. During public comment segment, a woman from College Park East presented the council with photos of what the area looks like when it rains. “We had two cars flooded in 2017,” she said. “We have to watch out how heavy the rain,” she said. “Residents have to watch out for their own property,” she said. She asked for more drainage. Susan Barembaum of College Park East said she hopes that the storm drain report is not just a temporary problem. Later in the meeting, Freeland said he had lost three cars because of flooding and “everything,” apparently meaning the cars, was computerized. Myrter and Zeki Kayiran, principal of AKM Consulting Engineers, led the council through an area-by area overview of the discussion. According to Kayiran and the slide presentation, Marina Drive improvements would cost more than $46.5 million. “If I win the lottery tonight, I’ll write you a check for $47 million,” said District Five Councilwoman Sandra Massa-Lavitt. As for College Park East, the golf course is a critical drainage facility for that area, according to Myrter. He said the drainage areas at Elder and Guava are not well defined. Kayiran discussed three alternatives with price tags of $10.6 million, $21.1 million and $30.7 million (all figures rounded by the Sun). Alternative 1 would install shallow storm drains and box culverts draining to Old Ranch Golf Course to address five-year storms. Alternative 2 would install shallow storm drains and a pump station at 4197 Ironwood Ave., which would drain into the golf course and address 10-year storms. Alternative 3 would install storm drains and an “in-line detention basin” and pump station at 4197 Ironwood Ave., which would address 25-year storms. “What kind of protection do we have now?” asked District Four Councilwoman Schelly Sustarsic, who represents College Park East. Kayiran said a little more than for three-year storms. Kayiran said College Park East is very flat. He said that even with modest rain flow, you would see water go up to the curb. Kayiran said there could be more pumping into the golf course, He said he would need to talk to the county. Kayiran said his solution would be to put a pump station in Bluebell Park. However, he decided against that because no funding was available. John Waller, a recent candidate for the District One council seat and a local budget watcher, expressed dismay that the community would have to wait until the budget project to address the issue. Myrter said the study was valuable when the city was looking for grant money. “I’ve worked in a lot of cities,” said Councilwoman Massa-Lavitt. She said Seal Beach was not unique in not having enough money to address storm drain problems. “There is not enough money in the world to solve the problems,” Massa-Lavitt said near the end of the meeting. 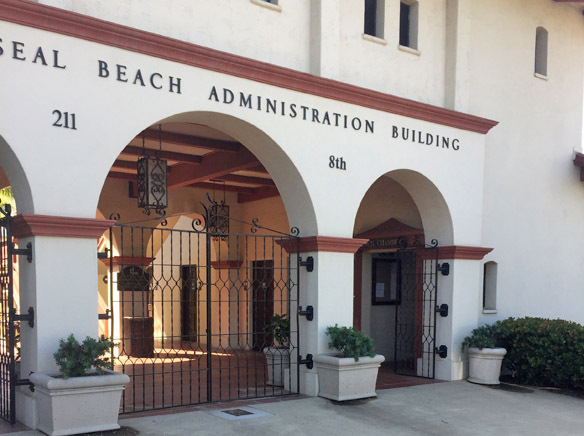 She said Seal Beach has to deal with a “$115 million fix” and that is not possible. She told College Park East residents that the city was not going to ignore their problems. A woman speaking from her seat in the audience said that she had lived in College Park East for 30 years. She said that nothing has been done about the problem. According to Myrter, the biggest challenge of meeting the goals of flood control because utility lines keep getting in the way of storm drain construction. Myrter pointed out that the term “100-year flood” refers to a 1 percent chance of a storm of that force. “Technically, you can have back-to-back 100-year floods,” he said. The following are the costs for other proposed storm drain projects, taken from Monday’s presentation. Asked for her main take-away from the meeting, Sustarsic emailed the following to the Sun: “The Storm Drain Focus Study found that trying to find a solution to the drainage problem in College Park East is very challenging. It was discouraging to hear just how expensive it would be to get even a slight drainage improvement in our tract. “However, it was very beneficial for staff to work closely with the City’s storm drain expert to analyze priority storm drain improvement needs and recommend alternatives and phases to future projects in order to help mitigate flooding citywide.